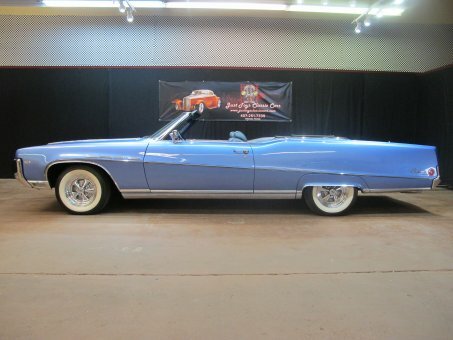 Just Toys Classic Cars is proud to present an iconic Buick Electra 225 Convertible. This car is known as a deuce and a quarter. We know that this is one beautiful Convertible and we feel that you will agree. This is only a 3 owner car so it has not been used and abused, just enjoyed. Just to look at the body lines on this beauty will just make you fall in love. The long sweeping lines on this beauty just draw you in to come an look at it and just fall in love. How do you not fall in love with an old classic Buick Convertible like this. This car has had one respray in it's life and it presents very well and is miles deep. The fit and finish on this car is as good as it gets. The interior of this car is as big as your house. The front and back seats are in great shape, and are as big as your old leather love seats. This car just begs you to slide in and just lean back and cruise. Just set the tilt wheel where you need it, and get ready to throw your arm around your honey, or just go cruising for some because this car draws the ladies. The top works just like it should and is in great shape. Top up or top down, this baby looks sweet. Under the hood is the original Buick 430 with a 4 barrel carb that puts out about 400 HP. This is mated to the original trans and rear end as well. As you will see in the photos, you are not going to eat your dinner off the under carriage, but everything is clean under there. Once you hit the key and fire this beauty up you will hear some nice rumble coming out of the back to let you know there is a little power under the hood, but not enough noise to where you have to yell over the exhaust. It has a very sweet sound to it. The other thing that we like about this beauty are the fat freddie white walls and the crager mag wheels. It just ads a unique and cool look to the car that is second to none. The rubber is in great shape on the car so you just get in and drive home. There are a ton of things that we could go on and on about this car, but you just need to get in touch with us today and find out just how easy it is to make this car yours. We offer classic car financing for those that would like to take advantage of the option. They have great rates and terms. This allows you to get the car of your dreams, and even pay it off when you want to with no pre payment penalties. We look forward to speaking with you soon, and we look forward to making you the newest member of the Just Toys Classic Cars family. From the very beginning of its activity our Used Trucks for Sale Auction has followed the principle of providing high-quality, pre-owned trucks, used pickups and other second hand cars to customers who want to maximize the value of money. Following the policy of honesty and full disclosure, our car website carries a wide selection of all makes and models so we can find the right truck to fit your needs.